Dezeen promotion: Czech glass and lighting brand Lasvit has created a responsive installation made up of 328 star-shaped light bulbs, which hangs from the ceiling of a university auditorium in Thailand. Lasvit crafted the 18-metre-long sculpture – titled Neurons – for Prince Mahidol Hall, which serves as an events venue for Mahidol University. The installation's name references its individual hand-crafted glass elements, which are shaped to resemble the neurons that carry sensory information – such as the sound of music – to the brain. The concept was developed through collaborating with the building's creators, A49 architects, who based the ribbed-beam design of the auditorium on the human skeleton. "Just as universities are the bearing points of progress, education and enlightenment wherever they exist in the world, a neuron is a carrier of information, thoughts and light within a human body," explained Lasvit designer Jana Růžičková. The dynamic sculpture uses advanced LED technology to activate the bulbs, which are encapsulated in hand-made glass components, acting as a visual companion alongside the harmonies of music playing in the space. The intensity of each bulb can be controlled individually, allowing for a variety of multi-coloured light sequences that are programmed to change depending on the pace of the music. Microphones placed on the podium in the concert hall are used to capture and relay sounds back to the installation. Neurons' responsive functionality is powered by an algorithm which was written by a team at Lasvit, who tested and analysed different styles of music at the site. The installation of Neurons took two weeks, with its 350 components transported to Thailand in a custom protective box, created specifically for the glass parts. 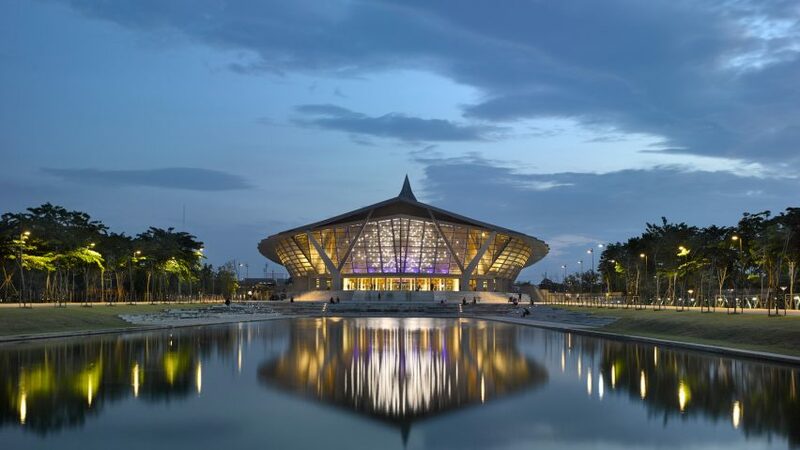 A49 Architects completed the 2,000-seat The Prince Mahidol Hall, which references various elements of traditional Thai architecture, in 2014. The theatre features a double-layer roof to reduce exterior noise during performances, while the entrance lobby and corridors are enclosed by large glazed windows, providing panoramic views of the building's surroundings. Founded in 2007 by Leon Jakimic, Lasvit specialises in producing glass lighting goods and installations, previously working with recognisable names such as Nendo, the Campana Brothers and Maarten Baas. Recently, the Czech company's creative director Maxim Velcovsky created a sculpture made up of thousands of smoky glass spheres to resemble the figure of a diver, which is suspended in the atrium of South Korea's tallest skyscraper. To find out more about Lasvit and its bespoke glass projects, visit the brand's website.